When I decided that I was going to be making Candle 79’s Cashew Cheese-Stuffed Yuca Cakes today, and I knew that (a) there was going to be a lot of yuca and (b) that I would get hungry before the yuca cakes were ready, I thought it would be fun to find a second recipe to make. 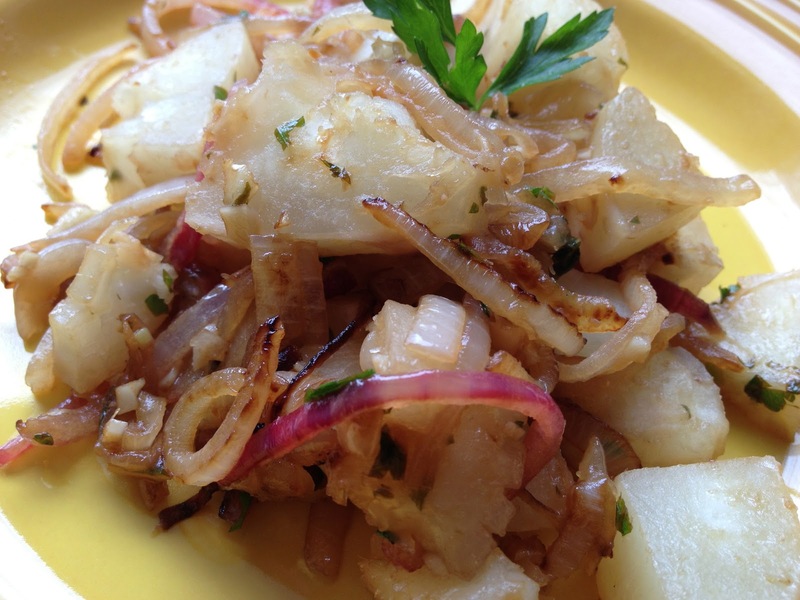 There is a famous Cuban dish (a national dish, to be exact) called Yuca con Mojo. So simple, but so good! Peel the yuca and cut it into chunks and cover with water in a big pot. Boil until tender, about 30 minutes. Drain. Dice the onion and sauté in olive oil. Add the mince the garlic and add to the onions, cooking on a low flame until fragrant. Add the lemon juice and chopped parlsey. Add the yuca to the pan and toss well. The yuca will absorb the lime juice and oil. Enjoy!